This is a quick introduction to what the software does, full instructions are in the software section. 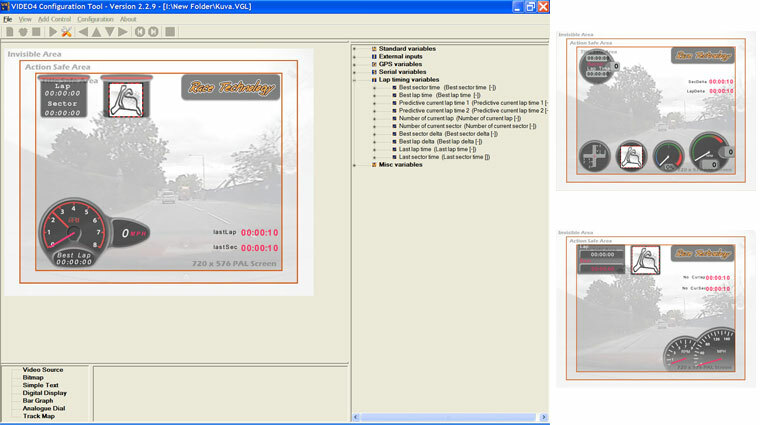 Users are able to create their own overlay design using the video sources and overlay objects in any combination using the RT VIDEO4 Configuration Tool. These objects can be assigned to RT Variable IDs which can control those objects dynamically (For example assigning SPEED variable to speedometer). The user can configure many settings using this tool including video format (NTSC or PAL), Video Bit rate, Recording Format (I, IP, IPB), Audio Volume, Chapter mark conditions and Brightness, Contrast, Saturation, Hue for each video input. RT Analysis software is used to analyse the video in parallel with data. Please read RT Analysis software documentation for more details. RT Video Playback Tool is used to playback video files with VD4 extension. Standard playback features like Play, Pause, Fast Forward, Rewind are provided with extensive fast frame jumping capabilities. Please read RT Video Playback Tool documentation for more details. RT DVD Burn Tool can be used to write the video files to a DVD disk which can be played back on any hardware DVD player. Please read RT DVD Burn Tool documentation for more details. RT VIDEO4 Controller software can be used to operate, test and simulate recording and playback capabilities of the VIDEO4 controller. This is very useful for developers who are expecting to develop third party software based on VIDEO4 hardware. See RT VIDEO4 Controller software documentation for more details.